May 25, 2010 - On June 5, astronaut Dr. Steve Robinson delivers a multimedia presentation about his February 2010 shuttle Endeavor mission STS-130 to the International Space Station, "Heavy Construction Made Weightless - Building the ISS." STS-130 was Robinson's fourth trip into space, where he served as the Flight Engineer and spacewalk operations officer for the flight. The program is part of the Honeywell Explorer Lecture series at the Museum. The presentation is in the William M. Allen Theater at 2 p.m. and is free with Museum admission. 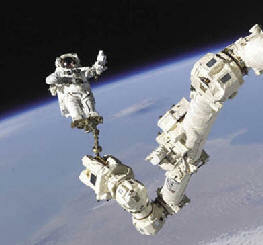 A veteran of three spacewalks himself, Robinson directed the spacewalks on STS-130 from inside the shuttle. He was also the chief mechanic for outfitting the new Tranquility node on the space station. Tranquility is now the life-support hub of the ISS. The large, seven-windowed Cupola viewing-station was also installed on the ISS during this mission. Astronaut Stephen Robinson rides Canadarm 2 during the STS-114 mission of the Space Shuttle Discovery to the ISS in August 2005. Dr. Robinson was selected as an astronaut in December 1994. Since then, he has held various technical assignments within the Astronaut Office at the Johnson Space Center, including: testing space shuttle control software, developing on-board computer and flight crew equipment, helping to develop the Space Station robot arm, and leading an astronaut team to specify window requirements for the new Orion crew capsule. He has also served as Spacecraft Communicator (CAPCOM) in Mission Control for 13 shuttle missions, functioning as the voice link between space shuttle crews and Mission Control. In addition to flying on four space shuttle missions, he has also served as a back-up crewmember for the fourth crew of the International Space Station. Robinson Spaceflight Experience; Shuttle Mission STS-85 Discovery (August 7 to 19, 1997): Robinson's responsibilities included flying both the shuttle robot arm and the experimental Japanese robot arm. On Shuttle Mission STS-95 Discovery (October 29 to November 7, 1998) Robinson was payload commander and led investigations on space flight and the aging process with crew member John Glenn. Shuttle Mission STS-114 Discovery (July 26 to August 9, 2005): The first shuttle flight after the loss of shuttle Columbia. Robinson served as Flight Engineer and also performed three spacewalks. Shuttle Mission STS-130 Endeavour (February 8-21, 2010): Robinson served as flight engineer and as EVA operations officer to direct the three spacewalks. The non-profit Museum of Flight is one of the largest independent air and space museums in the world. The Museum's collection includes more than 150 historically significant air- and spacecraft, as well as the William E. Boeing Red Barn - the original manufacturing facility of the Boeing Co. The J. Elroy McCaw Personal Courage Wing displays 28 World War I and World War II aircraft from the United States and other countries including Germany, Russia, and Japan. Over 30 aircraft representing the first century of aviation are displayed in the all-glass T.A. Wilson Great Gallery. The evolution of space flight and a look into the future are presented in the exhibit, Space: Exploring the New Frontier. The Airpark includes outdoor displays including the first jet Air Force One, a supersonic Concorde airliner and the prototype Boeing 747 jumbo jet. Interactive displays in The Flight Zone provide educational and entertaining activities for young children. The Museum's aeronautical library and archival holdings are the largest on the West Coast. More than 140,000 students are served annually by the Museum's on-site and outreach educational programs--the most extensive museum-based youth aviation and space education program in the country. The Museum is the only air and space museum in Washington State that is both nationally accredited with the American Association of Museums and a Smithsonian affiliate. The Museum of Flight is located at 9404 E. Marginal Way S., Seattle, Exit 158 off Interstate 5 on Boeing Field half-way between downtown Seattle and Sea-Tac Airport. The Museum is open daily from 10 a.m. to 5 p.m. Admission is $15 for adults, $13 for seniors 65 and older, $10 for active military, $8 for youth 5 to 17, and free for children under 5.